Don’t Pollute, Drop the AQMD Emergency Backup Generator Permit, Switch To Energy Storage – Battery Backup Power, Inc.
South Coast Air Quality Management District (AQMD) mandates that “all internal combustion engines (ICEs) greater than 50 brake horsepower (bhp) and gas turbines greater than 2,975,000 British thermal units (Btu) per hour are required to obtain a permit to construct from the SCAQMD prior to installation of the engines at a site” (Source: AQMD, http://www.aqmd.gov/home/permits/emergency-generators#Fact1). Following the initial construction fee, there is an annual operating permit fee and annual operating permit emissions fee. The government agency states that “a standby ICE or turbine for non-utility power generation that does not operate more than 200 hours a year and is only operated in the event of an emergency power failure or for routine testing and maintenance is considered an emergency backup generator for power generation.” (Source: AQMD, http://www.aqmd.gov/home/permits/emergency-generators#Fact3). According to the PTO Generator Buyer’s Guide, “basically, you need 2 HP to produce 1 kW of electricity…For example, a 50-HP engine is required to produce 25 kW of power” (Source: Electric Generator’s Direct, http://www.electricgeneratorsdirect.com/stories/22-How-to-Pick-the-Perfect-Power-Take-Off-Generator.html). That means that on average, a 50 HP emergency backup generator produces approximately 25 kW of power. A 30 kVA three phase Battery Backup Power, Inc. uninterruptible power supply has almost the same capacity, coming in at 24 kW of power. 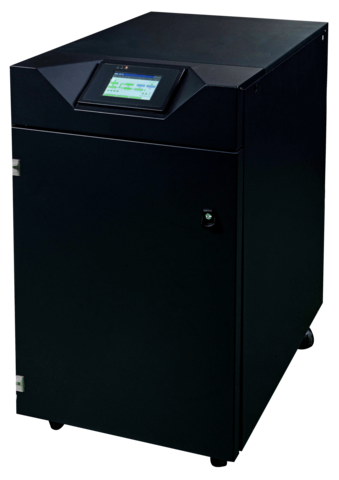 This uninterruptible power supply as well as its larger versions do not require an AQMD permit, do not face increasing environmental restrictions by the EPA or AQMD, and provide continuous/uninterrupted backup power. The UPS ensures that all electronics on its branch circuit stay on during a power outage rather than losing power and waiting the 2-15 minutes required for the generator to kick on. Existing versions include the above mentioned 24 kW UPS, a 36 kW UPS, a 48 kW UPS, a 64 kW UPS, a 80 kW UPS, and a 96 kW UPS (call 855-330-7799 or email engineering@batterybackuppower.com for details). Battery cabinet configurations can be customized by Battery Backup Power, Inc. to run a specific amount of time (I.E 16 minutes to 8 hours). Another option is to pair a large uninterruptible power supply with an emergency backup generator to minimize the generator’s hours of operation, reducing the risk of exceeding the 200 annual hour limit imposed by AQMD. A rule of thumb in this scenario is that the emergency backup generator on an automatic transfer switch must be 3 times the rated capacity of the UPS. This option does not remove the maintenance burden of the generator, as an emergency backup generator is usually cycled at least once a month and needs regular maintenance whereas a UPS usually only requires battery replacement once every 3 years.